Janelle Monae takes the stage for an electric performance at the 2019 Grammy Awards on Sunday (February 10) at the Staples Center in Los Angeles. The 33-year-old singer belted out her song “Make Me Feel” for the screaming crowd. Take a look at the entire list of performers and presenters for the 2019 Grammys if you haven’t checked it out yet! Lots of celebs are expected to take the stage tonight! Janelle Monae gives off angelic vibes at the 2019 Grammy Awards. The 33-year-old “Make Me Feel” singer hit the red carpet at the event held on Sunday (February 10) at the Staples Center in Los Angeles. She paired her white and purple dress, reminiscent of an elegant bird, with matching purple pumps, a gold and white headpiece, and an assortment of jewelry, styling her hair into a long braid. Besides performing tonight, Janelle‘s Dirty Computer is also nominated for Album of the Year, and her song “Pynk” is up for Best Music Video. FYI: Janelle is wearing Jean Paul Gaultier, Le Silla shoes, a Steve David hat, and Tiffany & Co. jewelry. 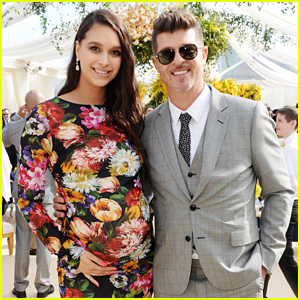 Robin Thicke and his pregnant fiancee April Love Geary pose for a photo while attending Roc Nation’s The Brunch on Saturday afternoon (February 9) in Los Angeles. The couple is expecting their second child together after welcoming their daughter Mia almost one year ago. Also in attendance at the event were Miguel and his new wife Nazanin Mandi, Janelle Monae, Normani Kordei, Justine Skye, and If Beale Street Could Talk actor Stephan James. FYI: Stephan is wearing an Etro suit and David Yurman jewelry. 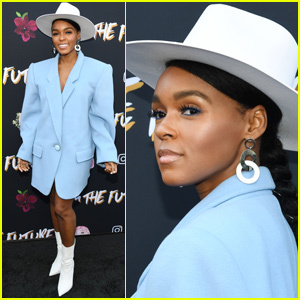 Janelle Monae Hosts Instagram 'Fem The Future' Brunch in LA! Janelle Monae teamed up with Instagram for an inspiring morning! The 33-year-old musician helped host the Fem The Future brunch on Friday (February 8) at Ysabel in Los Angeles. She was joined at the event by Lauren Jauregui, MILCK, Brandi Carlile and Linda Perry. “Every time a group of smart, talented women and aspiring allies come together, to make positive, tangible change, an angel gets her wings,” Janelle joked on stage. Janelle Monae & Zoe Kravitz's 'Screwed' Music Video Tackles Current Social Issues - Watch Now! Janelle Monae has dropped her futuristic new music video for “Screwed,” featuring Zoe Kravitz! The 33-year-old singer shared the visual with fans on Monday (January 7). “Screwed” is part of Janelle‘s film project Dirty Computer – An Emotion Picture, and the song is featured on her album Dirty Computer. 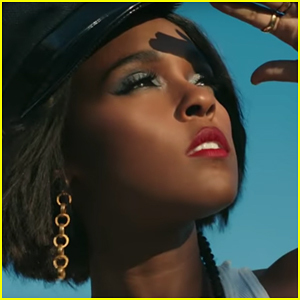 The video opens with Janelle and her friends waking up on the rooftop of a building and running away when they see a security drone flying above them. They later wind up at an underground party. There are also screens that feature political images, such as the Statue of Liberty, protests, a young woman wearing a Hijab, and fires. Tessa Thompson is also seen being taken away by security officers in a hovercraft.